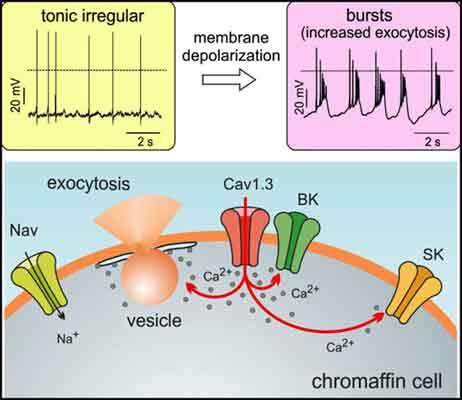 Neuronal and neuroendocrine L-type calcium channels (Cav1.2, Cav1.3) open readily at relatively low membrane potentials and allow Ca2+ to enter the cells near resting potentials. In this way, Cav1.2 and Cav1.3 shape the action potential waveform, contribute to gene expression, synaptic plasticity, neuronal differentiation, hormone secretion and pacemaker activity. In the chromaffin cells (CCs) of the adrenal medulla, Cav1.3 is highly expressed and is shown to support most of the pacemaking current that sustains action potential (AP) firings and part of the catecholamine secretion. Cav1.3 forms Ca2+-nanodomains with the fast inactivating BK channels and drives the resting SK currents. These latter set the inter-spike interval duration between consecutive spikes during spontaneous firing and the rate of spike adaptation during sustained depolarizations. Cav1.3 plays also a primary role in the switch from “tonic” to “burst” firing that occurs in mouse CCs when either the availability of voltage-gated Na channels (Nav) is reduced or the β2 subunit featuring the fast inactivating BK channels is deleted. Here, we discuss the functional role of these “neuronlike” firing modes in CCs and how Cav1.3 contributes to them. The open issue is to understand how these novel firing patterns are adapted to regulate the quantity of circulating catecholamines during resting condition or in response to acute and chronic stress. BK and SK currents, exocytosis, L-type channels, Nav1.3 and Nav1.7 channels, tonic and burst firing. Department of Drug Science, Corso Raffaello 30, I – 10125 Torino, Italy.